Rainbow Caverns on the TMMC is being modeled as three major show scenes: A bat cave filled with glowing eyes, colorful Rainbow Falls, and a beautiful grotto of color changing crystals. Major work has been completed on the central Rainbow Falls scene and that's the topic of today's post and video log. Most scenery and effects work is now complete on the upper section of Rainbow Falls, a major scene within Rainbow Caverns, and I'm excited to share the results today in a new post and video log. Tried and true "illusioneering" and stagecraft was used to bring this scene to life with a major element being the "Pepper's Ghost" rainbow effect in front of the falls. 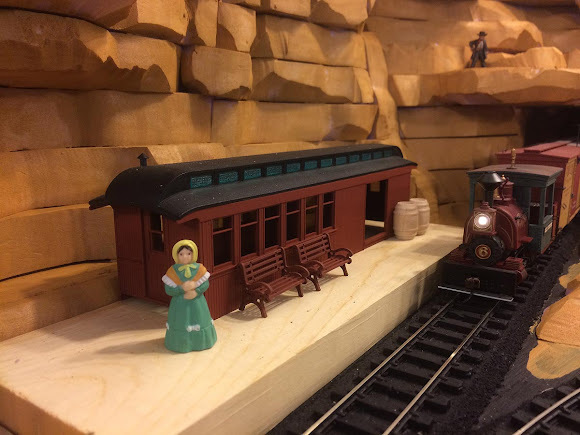 Check out this month's video log for a rundown on how the scene was created, and follow along with the photo's below for a more in-depth explanation. 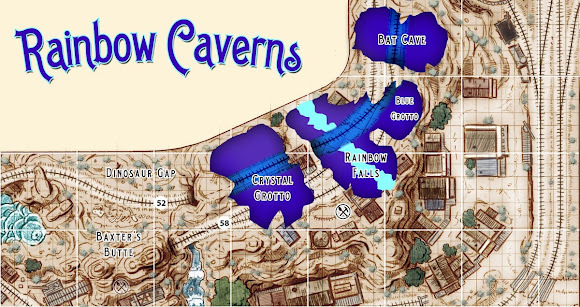 Some representation of Rainbow Caverns has been part of the plan for Thunder Mesa from the very beginning. 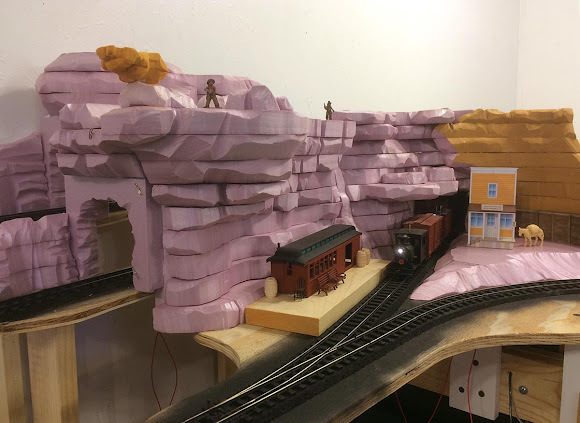 In fact, it goes back even further, starting with early plans to model Nature's Wonderland, and then on to my HO and On30 Big Thunder & Western layouts. 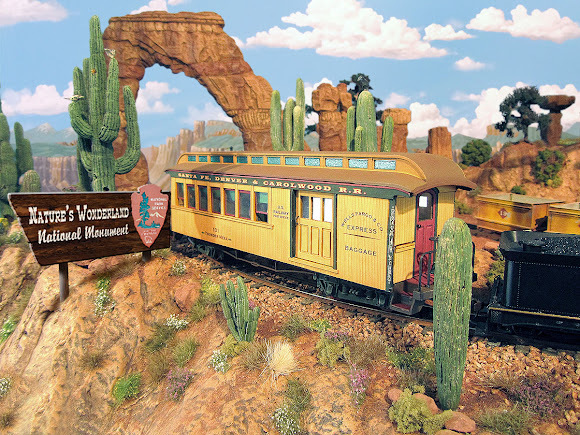 At long last I'm getting around to the real magic at the heart of this model railroad and having a wonderful time playing with miniature versions of some of those classic Disney effects. 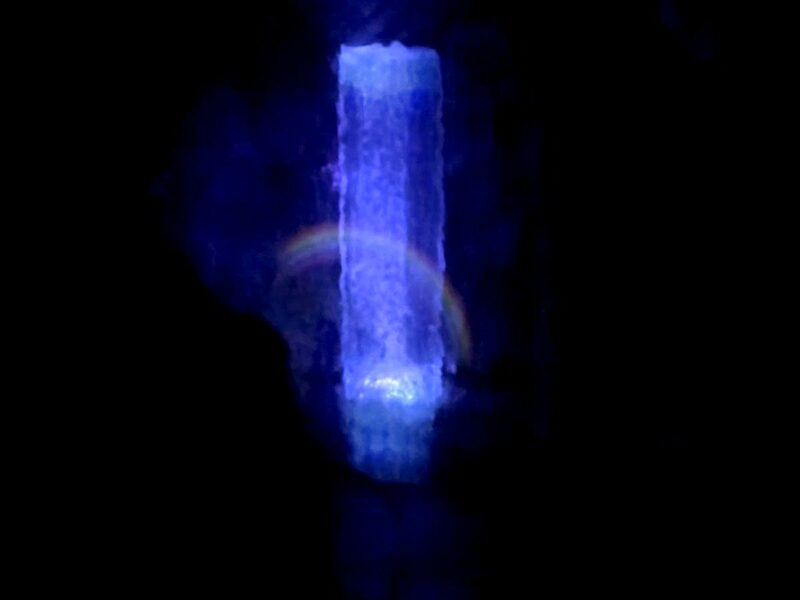 The Rainbow Falls scene is achieved with a combination of ultra-violet light effects and the classic Pepper's Ghost illusion. The waterfall is made from clear acrylic, painted on the back with transparent blue UV reactive paint. 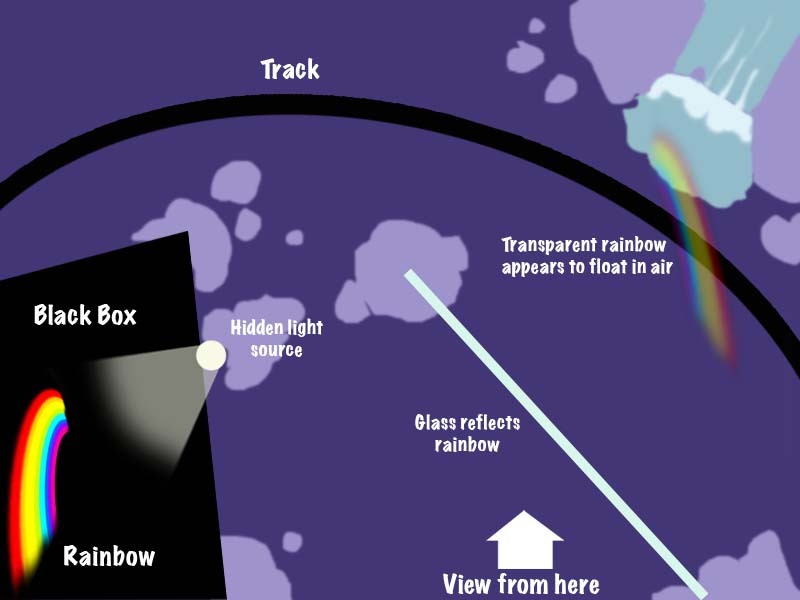 The "floating" rainbow is a Pepper's Ghost illusion - basically, a view-point controlled glass reflection. The Pepper's Ghost illusion is used to make semi-translucent objects appear to float in mid-air. In reality, it's the exact same effect you see when you look at your own reflection in a window. Here, however, the viewing angle is tightly controlled so that only the illuminated object, in this case a photo of a rainbow, can be seen in the reflection. If you've ever experienced the Haunted Mansion at a Disney park then you have seen expert use of this classic illusion. 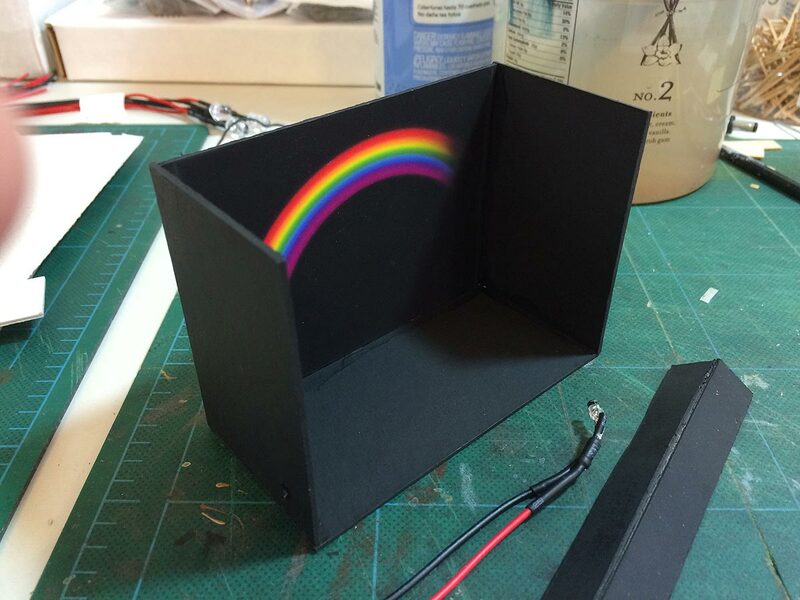 Here, a simple black box has been created from cardstock with a blurry rainbow printed against black glued inside. An improvement on this design would be to curve the image around the inside of the box so that no edges will be reflected. My second version (not pictured) does just that. 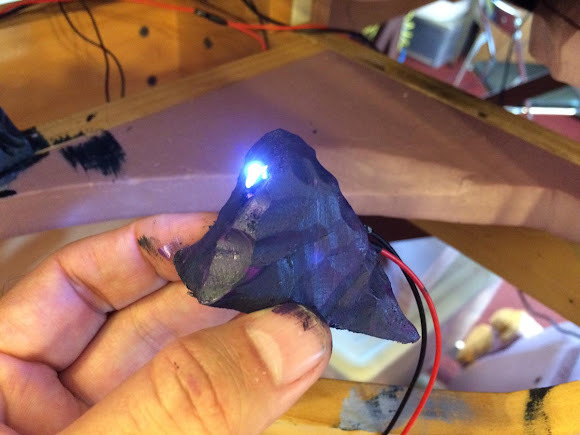 To illuminate the rainbow, a single white 3mm LED was installed in this faux rock fixture. The next step in creating the illusion is to position a piece of glass at an angle to reflect the picture or object but not the viewer. Note the the glass should be the full height of the scene. In this case, that's five inches. 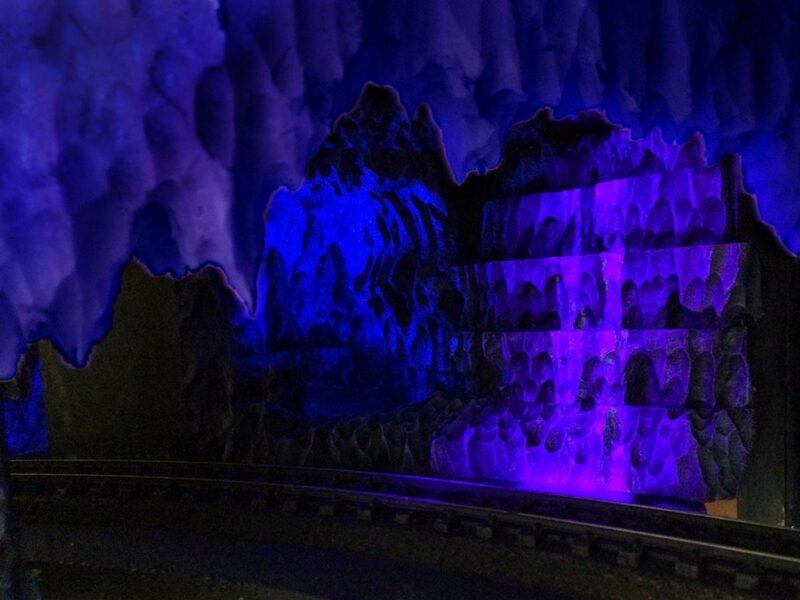 All of the rockwork inside the caverns is made from pink polystyrene foam. Some are like set pieces, and are removable for maintenance. 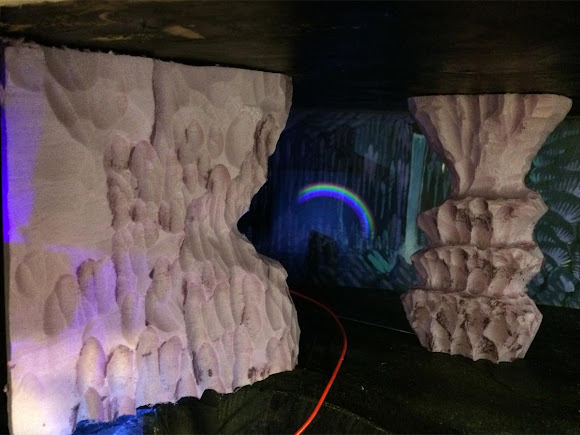 Layers of these set pieces are positioned to hide lighting rigs, and to complete the illusion of depth in the caverns when viewed from the proper angles. This is Stair Case Falls under UV light. 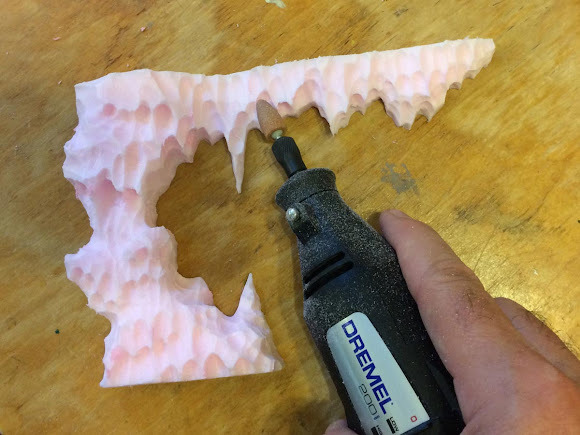 Here a piece of polystyrene foam is being shaped with a cone sanding bit in a Dremel tool. 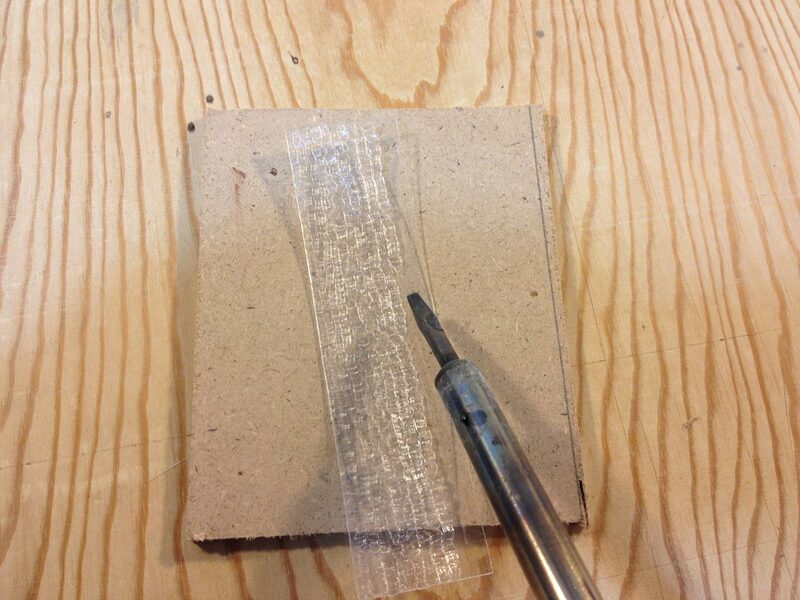 This goes fast but you have to be careful not to sand away too much! Each piece is then painted flat black. Once that dries, varies purples and blues are dry-brushed on for a mottled appearance. 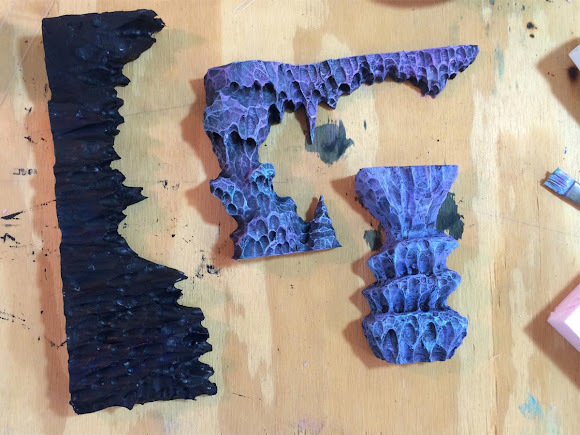 Keeping the rocks a dark blueish gray helps to make the UV painted objects pop and makes the caverns seem darker, larger, and more mysterious than they are. The waterfall was created in the same basic way as the waterfalls for Big Thunder Creek, by sculpting 1mm thick clear acrylic sheet with a hot soldering iron. 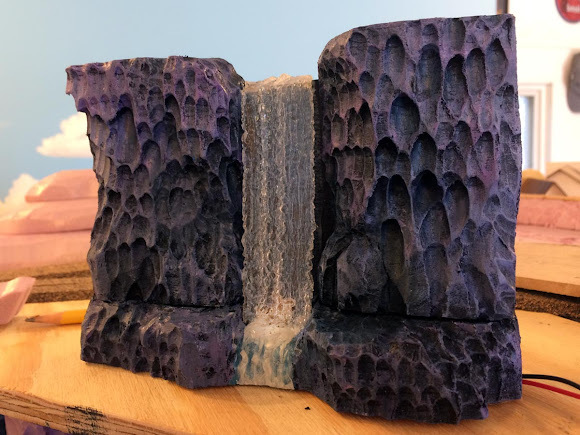 The acrylic waterfall was then painted on the back with blue transparent UV paint before being cemented in place on its own set piece with clear silicone caulk. A single 5mm UV LED is hidden behind the falls for illumination. Several of these 5mm Ultra Violet LEDs were positioned strategically in the scene for added illumination. Outside the waterfall, the creek itself is nothing but acrylic UV paint and gloss medium. 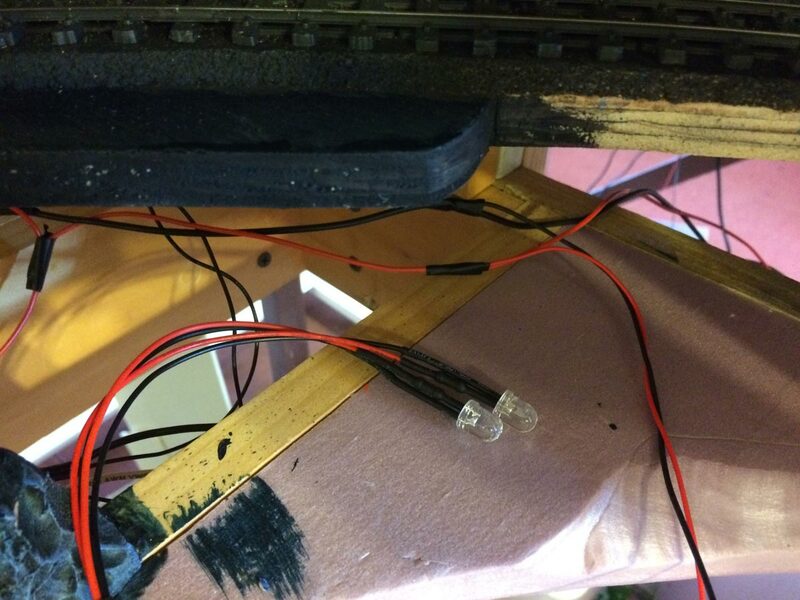 Here you cam also see the 12v wiring buss that runs below the caverns from a DC transformer. The red wire is positive and the black is negative - important to know when working with LEDs. 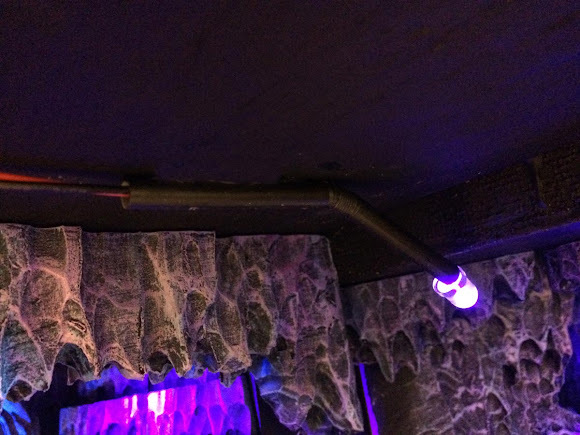 I needed a simple way to mount LEDs to the roof of the scene and still have them be flexible enough to aim the lights. Cheep plastic bendy straws came to the rescue. Painted flat black and attached to the ceiling with a dab of hot glue, they make for quite serviceable miniature lighting rigs. A scrim of rockwork hides rigs like this from view. Down below Rainbow Falls where the track crosses the creek on a stone bridge, there will be a series of deep pools, each slowly changing color as the magical waters drip down from above. Beyond the falls will be a Crystal Grotto, dancing with light. And let's not forget the Bat Cave with its hundreds of shining eyes. Yes, there's much more to come in Rainbow Caverns! But that will have to do it for this time. Thanks for checking in, Amigos. Adios for now! 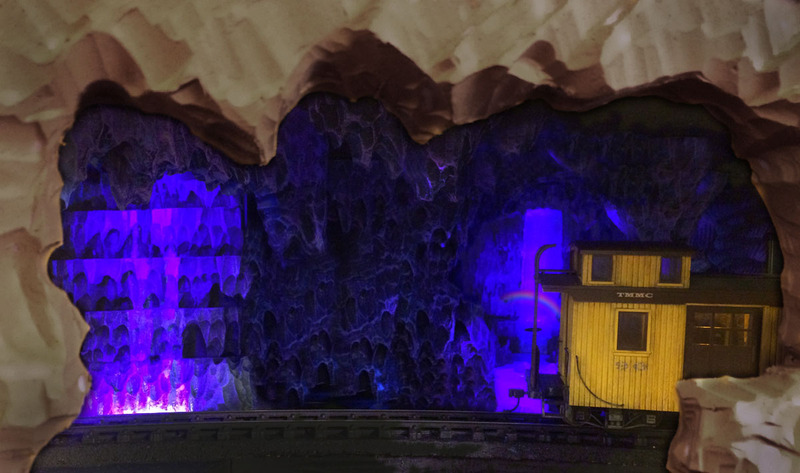 Once again, I'm back to work on Rainbow Caverns, bringing the "dark ride" portion of the TMMC to life. I'm currently up to my elbows in wiring, LEDs, and black light paint but plan on publishing a full step-by-step and how-to post in about another week. In the meantime, please enjoy this short video highlighting some of the effects in completed scenes thus far. Adios for now! *Note: Original Disney soundtrack has been replaced by royalty free music from YouTube. As the crummy waits on the mainline, engine #6, Ollie Johnston, spots a car at Hanging Rock siding before pulling forward to take on water at the tank. Crews are always a little nervous at Hanging Rock and never linger too long due to all of the outlaw activity in the area. About halfway down the line between San Lorenzo and Thunder Mesa is the whistle-stop burg of Hanging Rock. There's a water tank there, and an old combine repurposed as a depot, but not too much else. In recent years, the labyrinth of canyons, caves and rock ledges have become a haven for horse-thieves, rustlers, bandits and other unsavory types. Before the coming of the railroad, it was an Indian stronghold, a natural rock fortress where a handful of braves once held off an entire regiment of U.S. soldiers. Legends of lost Spanish gold lured a few hearty prospectors to the area but they didn't find much and now their old, abandoned diggings dot the cliff-sides. 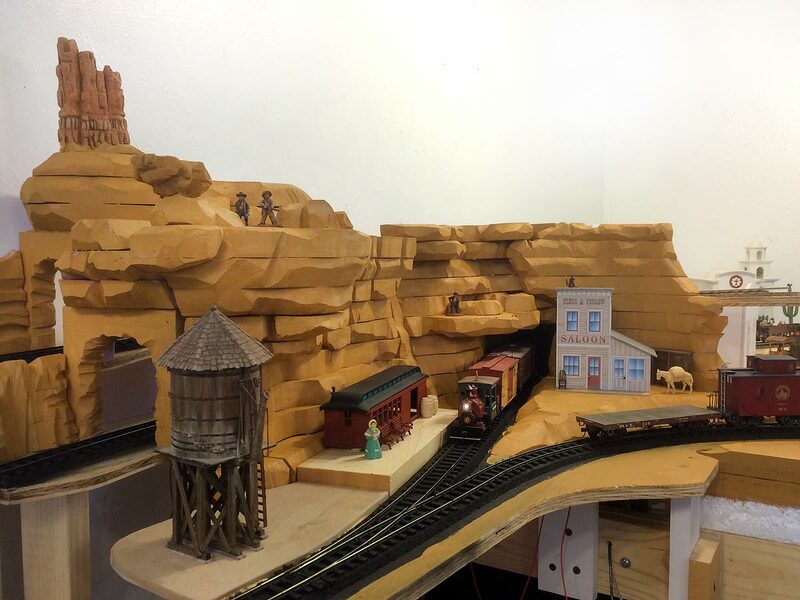 The height of prosperity arrived with the railroad in the late 1870's when a construction camp was established there for bridges being built across Horse Thief and Coyote Canyons. A couple of enterprising old railway men named Olson & Furlow opened a saloon and small store for the camp workers and it still stands between the tracks today, a haunt for outlaws and the only going concern left in town. Hanging Rock is a good place for an ambush or a hide-out and most decent folks don't stay long. Hanging Rock Depot is an old combine left over from the construction camp days. The Olson & Furlow Saloon seems to be the only business left in town. With all of the mainline track now laid and a good start made on the branchline up to Big Thunder Camp, I've decided to dive right in to the scenery at Hanging Rock. 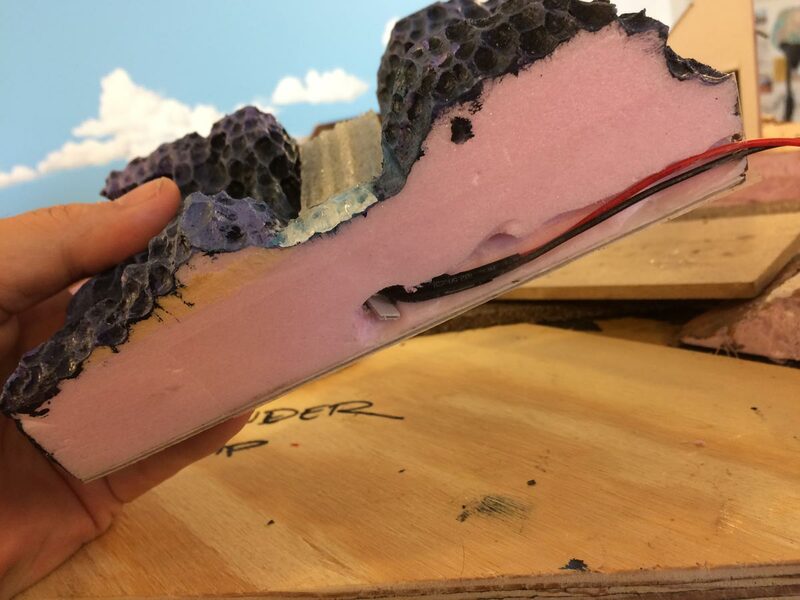 As usual, I'm roughing everything in with layers of 1" thick pink polystyrene insulation foam held together with Powergrab adhesive and pins. 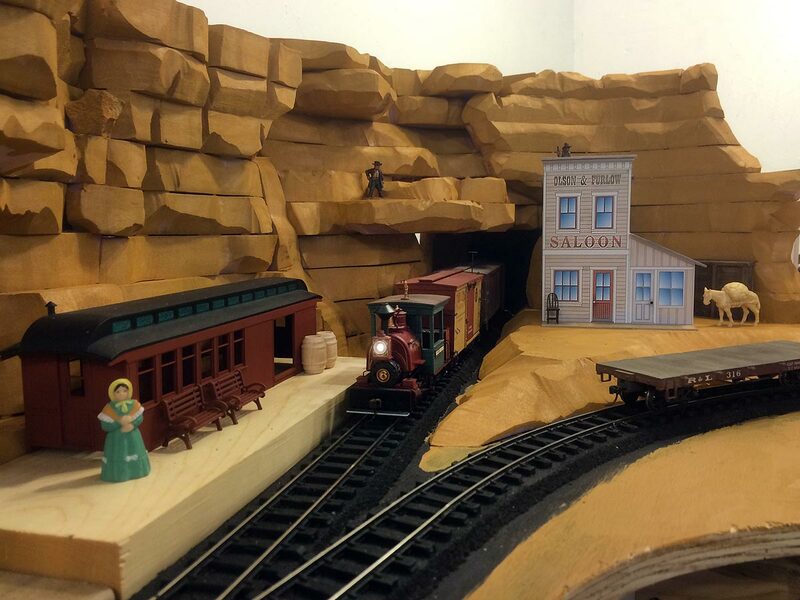 I really want the cliffs to tower above the trains here. The dramatic sandstone ledges overhanging the track are what give Hanging Rock its name. Unlike some other scenes on the layout, Hanging Rock has no corollary at any Disney park. I wanted to do something entirely original here. Still, the scene is being designed with the same playful spirit and attention to story in mind. Here's an overview of all of the track through Hanging Rock. The uppermost "high-line" is the branchline on a 6% grade up to Big Thunder Camp. The track is painted flat black as the first step in my track finishing process. More on that in a future update. Pink foam was used to rough in the tunnels and cliffs around Hanging Rock. I use a hot wire cutter and hobby knives to shape the foam. The next step is to paint it tan. It's not necessary, but I've gotten into the habit of doing it as it helps me to visualize the final result. By the way, this view only shows the first half of the mesa. The second half will be built on the San Lorenzo side and include a forced-perspective village of Indian pueblos on the very top. The mesa top will be removable to allow access to the tunnels. A defunct Bachman combine is being pressed into service as a station. So far, the project hasn't progressed much beyond a coat of primer. 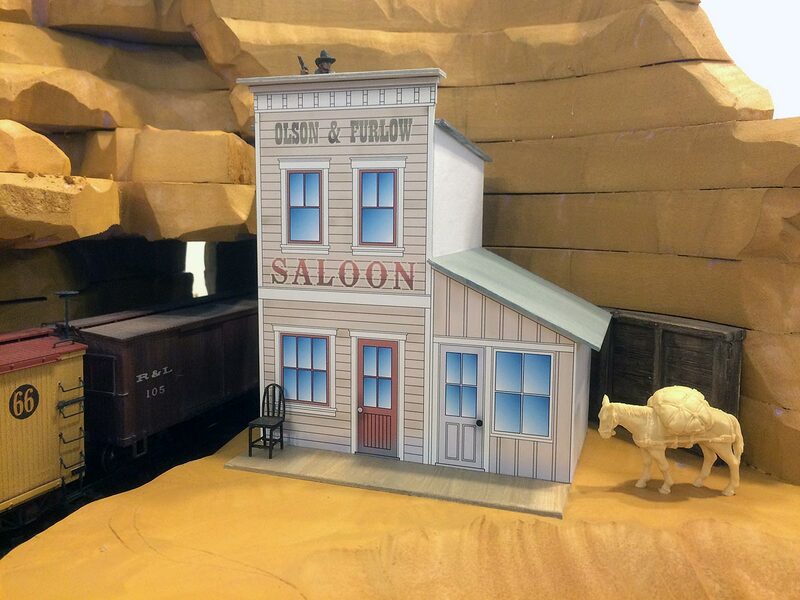 I thought it worth the time to build a mock-up of the Olson & Furlow Saloon. 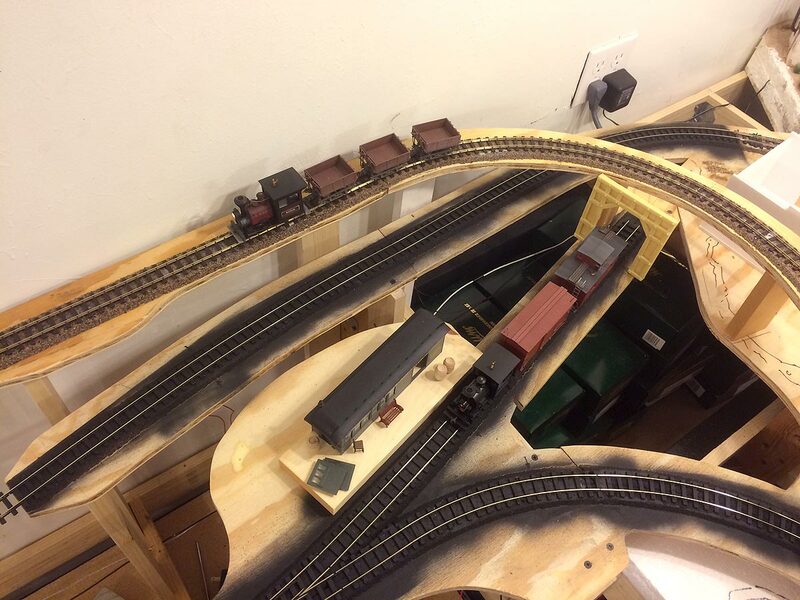 This will be a very detailed, scratch-built structure and my tribute to a couple of favorite old narrow gauge modelers, John Olson and Malcolm Furlow. One prominent sandstone ledge high above the tracks is known as Robber's Roost. The Hanging Rock Gang almost always keeps a lookout or two there. 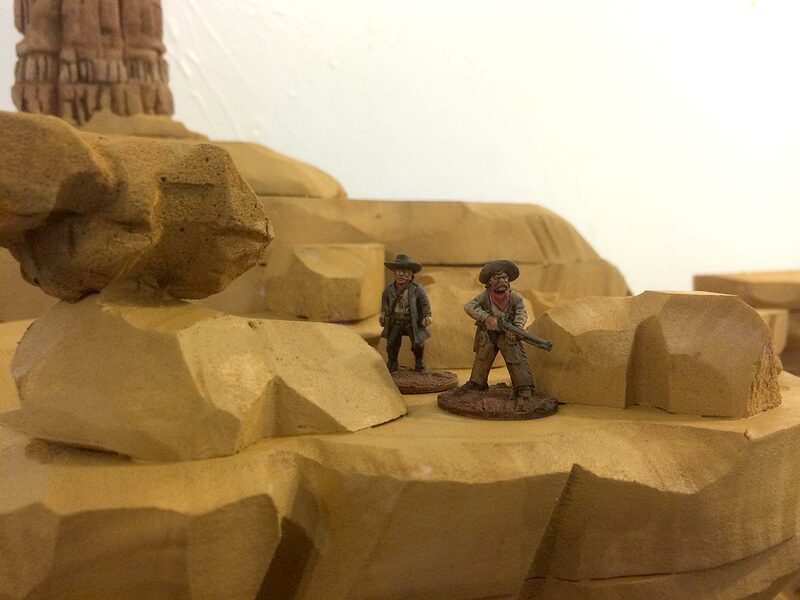 These great looking figures were painted for me by Tim Kulinski. 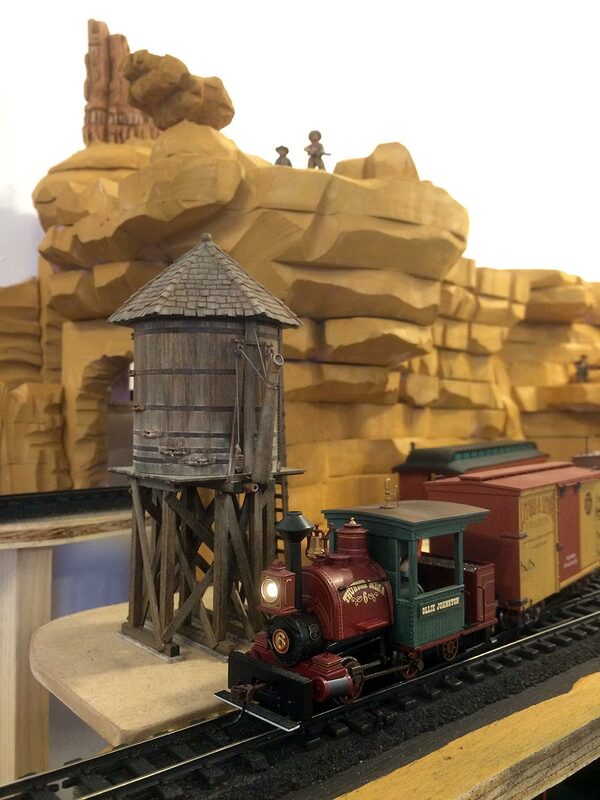 The water tank was built and modified from a Banta Model Works kit. I built it for Thunder Mesa yard but it's a little small and I kind of like it better here. It might just stay. The next step in building Hanging Rock will be to skin the foam with rocky-textured Sculptamold and add a few Balsa Foam detail carvings. Then the tunnel portals and interiors will need to be detailed and all of the rock work painted. After that, the structures get finished and ground cover, plants and final details will be added. There's always lots to do on Thunder Mesa so I'd better get cracking! I'm happy with the start I've made on Hanging Rock and very excited to finally be adding some scenery to the long-planned expansion areas. Thanks for checking in, amigos. Adios for now!